Have you had trouble finding small balloons? We have them! Check out our special 5-inch latex balloons. Multiple colors. 5" Solid Latex Balloons There is 1 product. 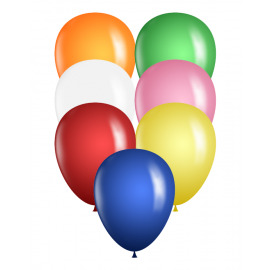 100-count bag of 5" Qualatex Latex Balloons in assorted colors. Bag includes red, blue, orange, green, yellow, pink, and white balloons.